As I mentioned in a comment, a pancake sale was held outside the local shop today, in aid of CRY. 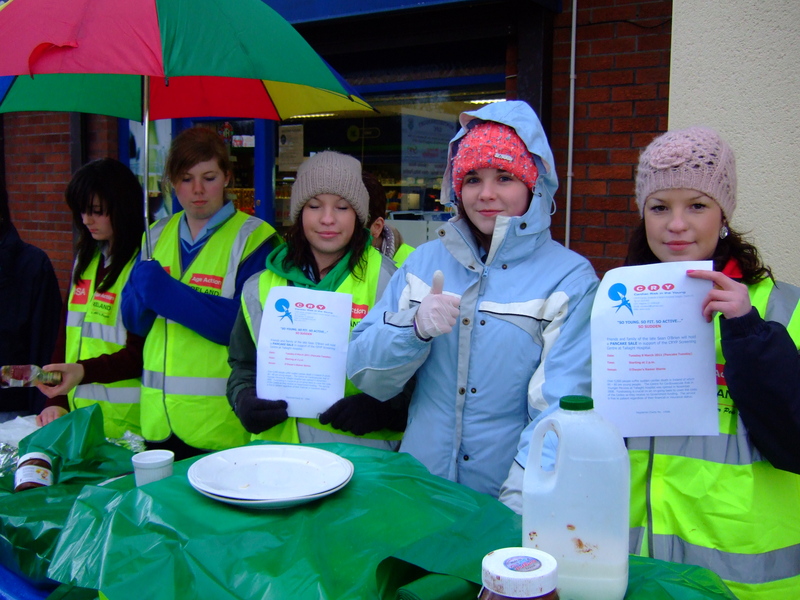 It was a massive success … despite the wet and miserable weather, €755 was raised. The people of this small community are always extremely generous in supporting good causes. The event was held in memory of Sean, and lots of people helped with it – we are very grateful to all of them, and especially to Sarah, who was the driving force behind it. Sean would be very proud. Good stuff Brendano. I missed out on a pancake today. Used to love them, lemon and syrup in generous measure. Well done all the ladies; yes Sean would have been well chuffed. PS I saw the Barca game at a mate’s address. A privilege to watch it — booooootifull football, and Wenger flapping like a distressed penguin. Where would Sean’s loyalties have been? Perhaps he has a ring-side seat. He was technically an Arsenal fan, but had a soft spot for several of the big European clubs. He would have been disgusted at Van Persie’s red card – surely not justified (I saw the match from then on). Barca did look very good. I hope they’ll go on and win it (maybe Spurs will stop them :-)). Another sign of his powerful effect. How many months is it since Sean gone? He can still drive people to make things in his memory. Hi Levent … good to see you. It will be five months next week. People did, and do, care about Sean. They still leave messages on his Facebook page, for example. The pancake sale was held for other causes in previous years, and made far less money. Hello Brendano. I am glad that the pancake event was a success. 755 euros is a large amount of money to be raised by a small rural community, selling pancakes. Generous people, giving both their money and their time. I ate my pancakes in the Welsh heartlands this year. The rural land of my fathers! The fields were full of gambolling lambs. I was accompanied by my younger son and I thought about the photograph of your son with the lamb. There were daffodils everywhere too. I spoke Welsh, and read in Welsh at the chapel. Very strong country community, no doubt similar to your own in many ways. Hello Cymbeline … it’s good to see you. It sounds like your visit to Wales has been good for your soul. Wales v. Ireland in rugby tomorrow! I’m well, thanks. I’m going to be taking part in various musical events over the next week (St Patrick’s Day is next Thursday, which should be fun). Yes, the pancakes raised a lot of money, which may be augmented by a raffle next week. I have been reading about the CRY charity in the link you supplied. Thank you for the information, and I hope the raffle goes as well as the pancake day. Important. Thanks, Cymbeline. CRY was very happy with the money raised, and some of the people here are keen to do some more fundraising. We’ll be availing of the CRY service ourselves later in the month. Yes. I remember you writing that you were going to be screened. I wonder if you have been able to meet other parents through CRY who have lost their children due to sudden cardiac arrest? No, although we did already know another couple who lost their teenage son in that way. We haven’t had Sean’s post-mortem results yet … cardiac arrest is the most likely cause, though, so we’re working on that basis. Yes. Important to know. In Wales, we were looking at old family photographs and talking about them. In the late 1920s, a boy in my family died suddenly at the age of fifteen, for no apparent reason. Very sad. We are probably more conscious of the impact of loss now that it has happened to us. Yesterday I was talking to one of the undertakers that buried Sean. He told me that he had lost a two-year-old son to cancer.